A train arrives at a rural station and a lone police officer disembarks, looking for "Thakur Sahib" (thakur, literally "lord, master," is a respectful title for a member of one of the landlord castes who trace their lineage to ancient kshatriyas or warrior-aristocrats; Sahib means "sir"). As the credits roll, we follow his horseback journey through a Badlands-like landscape to the remote settlement of Ramgarh (“Rama’s fort”). Here he meets the Thakur, Baldev Singh (Sanjeev Kumar), a retired police officer who is always wrapped in a gray shawl. Singh requests his visitor to locate and bring him two criminals, the scruffy, ever-smiling Veeru (Dharmendra) and the lanky, brooding Jaidev or “Jai” for short (Amitabh Bacchan). When the officer asks what task these notorious repeat-offenders can possibly be suited for, Singh recounts his first meeting with them, two years earlier, when he was transporting them to jail via a freight train. Immediately after they boast to him of their courage, the train is attacked by bandits, and they defend it and their wounded captor against a seemingly unending troop of horsemen. But their moral ambivalence is revealed when they toss a coin to decide whether to bring the bleeding officer to a hospital (landing themselves in jail), or to escape (leaving him to die). In a motif that will be repeated, "chance" impels them to do the Right Thing. The flashback ends with Singh's visitor promising to search for the pair, but adding that, if they are out of jail and at large, it may be difficult to locate them. One of the biggest hits in history of Bollywood, Sholay (in English as Embers, Flames, Flames of the Sun), was recognized as the Best Film of 50 years at the 50th Filmfare awards. It was India's first 70 mm, stereophonic sound film and was released on Friday, August 15, 1975, with as many as 250 prints, including at the Minerva Theatre in Bombay (now Mumbai). 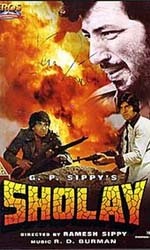 Sholay, directed by Ramesh Sippy and produced by G P Sippy, altered the course of Indian cinema. This was the first film in the history of Indian cinema to celebrate silver jubilee (25 weeks) at over a hundred theatres across India. To date, more than 1,100 prints of Sholay are in circulation-the highest number for any Hindi film. Sholay is the highest grossing movie of all time in India with collections of Rs. 2,134,500,000/- or US $ 50 million. Even today, it remains the box office gold, a reference point for both the Indian film-going audience & the film industry. It is widely acknowledged by movie critics to be one of the best movies ever created by Bollywood and to be the most watched and popular. It was declared "Film of the Millenium" by BBC India and internet polls in 1999. A great ensemble cast, spectacular cinematography, superb performances from each actor, powerful dialogues & music boosted this superlative film. Cast: Amitabh Bachchan, Dharmendra, Sanjeev Kumar, Amjad Khan, Hema Malini, Jaya Bachchan, Asrani, Helen, Mac Mohan, Sachin, Jagdeep, Satyen Kappoo, A K Hangal, etc. When released the film was initially declared to be a commercial disaster. However, the collections slowly picked up and became a huge hit. As a testament to its popularity, the movie ran uninterruptedly for five and half year (286 weeks) at the Minerva in Mumbai. (Though Aditya Chopra's Dilwale Dulhania Le Jaayenge has crossed its 300 weeks mark at Maratha Mandir (Mumbai), the film was not released in this theatre at its release time.) For 75 weeks the current booking of Minerva remained shut as the prestigious cinema hall used to get full in advance booking itself! Sholay fetched Rs. 50 lakhs as distributor's share from the Minerva, Mumbai which could be estimated at approximately Rs. 5 to 7 crores today. Ramesh Sippy's Sholay, a 1975 Indian blockbuster, has proved that its popularity is not restricted to India only, but is able to pull the crowd elsewhere too, as the Iranians voted it as their favourite film. A poll by the Islamic Republic of Iran Broadcasting's (IRIB) Research Centre showed that the celebrated movie had drawn the most audience attention. Sholay was telecast on the network between June 22-July 22 that outdid Iranian directors Kiumars Purahmad's Strange Sisters and Kamal Tabrizi's Maternal Love, aired during the same period, which stood second and third respectively for audience attention.